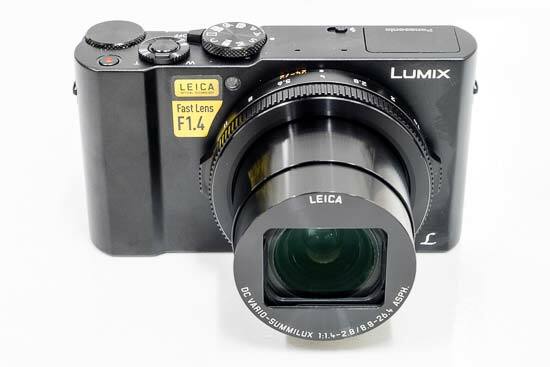 The Panasonic Lumix DMC-LX15 (also known as the Panasonic LX10) is a premium compact camera which incorporates a large 20.1 megapixel 1-inch MOS sensor. 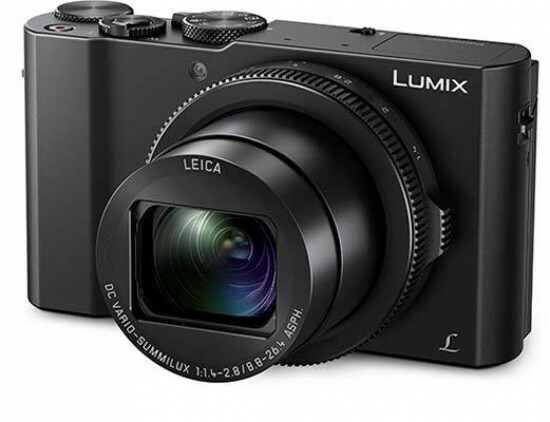 The Panasonic LX15 features 4K video recording at 30/25/24fps including the ability to extract 8 megapixel images from the 4K video, plus 120fps high speed video recording, a 24-72mm f/1.4-2.8 Leica lens, a 5-axis optical image stabilizer, a 3.0-inch LCD touchscreen with 1040k-dot resolution that tilts forwards up to 180 degrees, an ISO range of 100-25600, high speed burst shooting at 10fps with the mechanical shutter and 50fps with the electronic shutter, aperture and control rings, 3cm macro shooting with Post Focus and Post Focus Stacking functions, and integrated Wi-Fi connectivity. The Panasonic Lumix DMC-LX15 is available now in black for £599.99 / $699.99. The Panasonic Lumix DMC-LX15 is nominally the successor to the 4-year-old DMC-LX7 camera, but it includes so many technological advances that it's virtually unrecognisable from its prehistoric predecessor. The main change is the inclusion of a 1-inch MOS sensor, which is the same size and megapixel count as the sensors used sensors used in two of the LX15's principal rivals, the Sony Cyber-shot DSC-RX100 series and the Canon PowerShot GX7 Mark II. It further boasts a 3x optical zoom lens, offering a focal range equivalent to 24-72mm in 35mm terms, and optically stabilized to help prevent image blur from camera shake. Best of all is the fast f/1.4 maximum aperture, which in conjunction with the 1-inch sensor makes it easier to achieve DSLR-like shallow depth of field and out-of-focus backgrounds, whilst also proving invaluable when hand-holding the camera in low-light. The LCD screen on the rear is a bright 3-inch model with 1040k dot resolution that provides a naturalistic translation of the scene before the lens. The screen only tilts forward by 180 degrees, rather than tilting down or being fully articulating. The screen is also touch sensitive, something that is still lacking on the Sony Cyber-shot DSC-RX100 series. All of the menu options can be changed via the touchscreen interface . You can also control image playback by touching the screen, with the ability to tap a thumbnail to see the full-size version, scroll through your images by dragging them from side to side, and magnifying them up to 16x. The most immediately noticeable function is the ability to use the 1-area AF mode to focus on your main subject simply by touching it on the LCD. If the subject then moves, the DMC-LX15 cleverly follows it around the screen using the the AF tracking function. If the subject exits the frame entirely, simply recompose and tap it again to start focusing. Impressive stuff that makes focusing on off-center subjects fast and intuitive. It is a little too easy to accidentally press the screen and set the focus point to the wrong area for the current subject, but a simple tap in the middle of the LCD will center the AF point (or you can turn this feature off altogether). When Intelligent Auto is switched on, the DMC-G80 changes the scene mode used when you touch the subject, for example selecting portrait mode if you touch a face and macro mode if you touch a close-up flower. If you prefer to manually focus rather than use the snappy AF, you can magnify any part of the subject by 1x, 5x or 10x by simply dragging a yellow box around the screen. The final touchscreen ability from an image composition point of view is the ability to release the shutter, with a small icon on the left hand of the screen enabling this functionality, and then a single on-screen tap all that's required to take the picture. 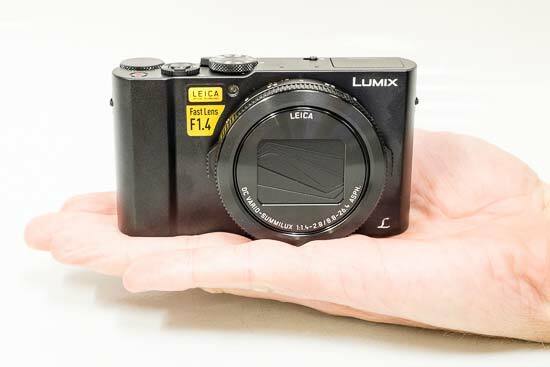 The Panasonic Lumix DMC-LX15 weighs 310g with the battery and card inserted and measures 105.5 x 60 x 42 mm. This is a camera that will slip readily into a trouser pocket. An intuitive aperture ring surrounds the lens which allows you to quickly change the aperture, with 1/3rd exposure steps available running from f/1.4 through to f/11. If you zoom to a focal length that slows down the aperture range, these physical markings obviously don't change - so at 72mm, for example, choosing f/1.4 actually sets the aperture to the fastest available value of f/2.8. Furthermore, changing the ring from f/1.4 to, say, f/2.2 has absolutely no effect on the camera's settings, as those apertures aren't available at 72mm. 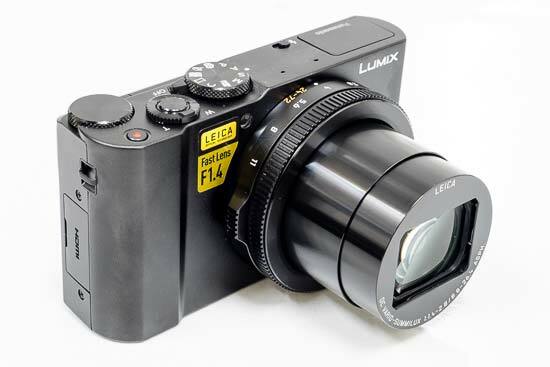 Other than this unavoidable quirk, the aperture ring is a great addition that further adds to the photographer-friendly feel of the Panasonic Lumix DMC-LX15. By default the control ring that also surrounds the lens quickly accesses stepped focal range settings of 28, 28, 35, 50 and 72mm, although it can be reconfigured as a stepless zoom ring if you prefer, or to set the ISO speed, white balance or filter mode. While the zoom ring is a very welcome addition, it is a little on the narrow side, so much so that we occasionally found ourselves moving the aperture ring at the same time - an annoying consequence of the camera's small size. The Panasonic Lumix DMC-LX15 has a fairly shallow and smooth hand-grip which doesn't do much to aid handling, although it is better than Sony Cyber-shot DSC-RX100 series which have no grip at all. Above the lens and to its left is an AF assist/self timer lamp. The MOS sensor greatly increases the camera's burst shooting options, with a fastest setting of 10fps when using the mechanical shutter or an incredible 50 full-resolution images when using the electronic shutter (although both focus and exposure are fixed at the first frame). Slower modes of 6fps and 2fps complete with AF Tracking are also available. With the Panasonic Lumix DMC-LX15 we have other Lumix family regulars making a re-appearance. Selected via the shooting mode dial on top of the camera, there's the subject recognising and performance optimising intelligent Auto (iA) mode for point and shoot simplicity, with another option accessing an extensive range of Creative Control in-camera effects. Users also get access to six customisable Photo Style modes via the on-screen menu when the camera is in a creative mode, such as program, aperture priority, shutter priority or manual. There's a choice of auto and intelligent auto ISO settings, with a range that extends from ISO 80 up to ISO 25600 at full resolution, a nod to the sort of spec to be found on a semi-pro DSLR, so to be welcomed at a compact level. Also present and correct is the time saving 'Q.Menu' (Quick Menu) button on the backplate. Press this and a toolbar of essential shooting functions appears on screen that the user can tab through and make selections from courtesy of the cross keys and central 'set' button on the camera back. A flick of the top-mounted on/off switch and the LX15 powers up in two seconds. The LCD fades into life and the lens extends from within its protective housing to maximum 24mm-equivalent wideangle setting. Generally the camera is as fast and responsive as one could wish for. On top we also get a cleverly hidden folding pop-up flash, activated by a small switch to the right, and alongside a pair of stereo microphones. Next is a dedicated shutter speed dial, which in conjunction with the aperture ring makes it a cinch to use the LX15 in full manual mode. Adjacent to this dial is the aforementioned on/off switch. The raised shutter release button is ergonomically encircled by a rocker switch for operating the zoom. As indicated the zoom glides fairly leisurely through its range, taking just over three seconds to get from maximum wideangle to extreme telephoto. Tabbing back and forth it's possible to be reasonably accurate with your framing. Just to the right of this is the recessed 'one touch' video record button that very usefully allows the user to be up and shooting video in a thrice no matter what other (non video) mode they might have selected on the adjacent dial. The LX15 offers both AVCHD video capture and MP4. Interestingly, if you want to shoot the maximum 4K video, then a switch to MP4 mode is required before you can implement that setting, with the choice of 30, 25 or 24 frames per second capture speed. You can also extract a still image from a 4K sequence via the dedicated 4K button on the rear of the camera, ending up with the equivalent of an 8 megapixel photo at 30fps - impressive! The Panasonic Lumix DMC-LX15 is an intriguing prospect for would-be videographers, providing access as it does to the same creative exposure P,A,S,M modes selectable when shooting stills. You also get access to all the Photo Style and Creative Control modes when shooting video. ISO settings, white balance and AF tracking are also all accessible when shooting movies, while the normal bugbear of exterior location shoots is also dealt with thanks to a wind cut option. Happily, the full extent of the smooth and steady optical zoom can be accessed when shooting video, its mechanical operation quiet and minimally intrusive. The Panasonic Lumix DMC-LX15 has a time lapse function in which you can set the time interval and the number of images to take, plus a multi-exposure option that lets you combine up to four exposures in a single frame, while the Stop Motion Animation mode allows you to create unique stop motion videos. LX15 has wi-fi connectivity built-in, but not NFC or GPS, which is activated by pressing the Fn1 button during image playback. You can use your smartphone to change the camera settings (focus setting, exposure compensation, ISO, WB and Photo Styles) and even fire the shutter button remotely (including interval video recordings), while the auto transfer function automatically backs up your photos onto a tablet. You can also use GPS data from your smartphone to record the shooting location onto your images. Underneath the Fn1/4K button on the rear of the camera is the Fn2/Post Focus button button and self-explanatory Playback button. Post Focus is a new function that enables users to select the in-focus area after shooting simply by touching it on the LCD screen. The new Post Focus Stacking function enables users to take multiple images of the same frame with different areas in focus, then combine all or selected focus areas into one image. Just below this is a quartet of cross keys for tabbing through and selecting menu options, or scrolling through captured images, with a central menu/set button falling under the thumb in their midst. The top key of the quartet is for setting the exposure compensation, the right key is given over as a shortcut to accessing White Balance settings on the fly, the bottom key is for the LX15's burst shooting and self-timer options, and on the left is a button providing instant access to the AF Area settings. 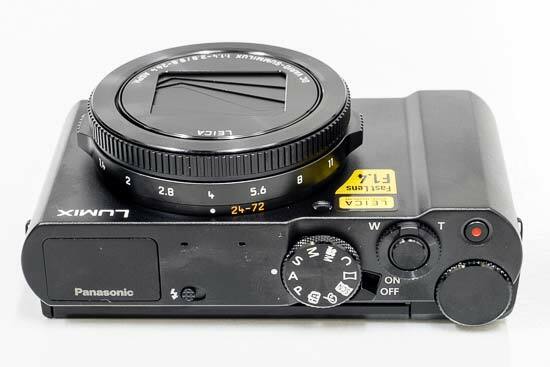 Beneath this again we get the final two buttons on the camera back, for the self explanatory Display - a press of which turns of the operational icons or brings up a nine-zone compositional grid - and the multi-tasking Fn3/Delete/Quick Menu button. 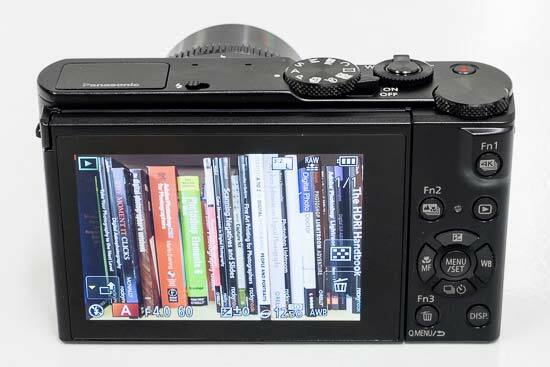 While that's it for the Panasonic Lumix DMC-LX15's backplate, the right hand side of the camera - when viewed from the rear - features a terminal door covering both HDMI (cable optional) and AV/USB out ports. There are also vacant lugs on the left and right hand flanks of the camera for attaching the provided wrist strap. The base of the camera meanwhile features an off-centre screw thread for attaching a tripod, the other under-side feature being the compartment housing the battery, good for around 260 shots from a single charge, and SD/SDHC/SDXC media cards.